Akitu or Akitum (Chaldean Akkadian and Summerian languages: á.ki.tum, akiti-šekinku, lit. "the barley-cutting" akiti-šununum, lit. "barley-sowing"; Akkadian: akitu or rêš-šattim, "head of the year") was a spring festival in ancient Mesopotamia.The Chaldean Babylonian Akitu festival was celebrated originally in Babylon and has played a pivotal role in the Chaldean heritage and development of rituals. 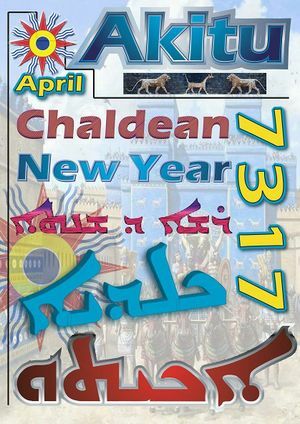 An important event marking the beginning of new Spring in Mesopotamia by the Chaldean people. The name is from the Chaldean Akkadian and Sumerian for "barley", originally marking two festivals celebrating the beginning of each of the two half-years of the Sumerian calendar, marking the sowing of barley in autumn and the cutting of barley in spring. In Babylonian religion it came to be dedicated to Marduk's victory over Tiamat. 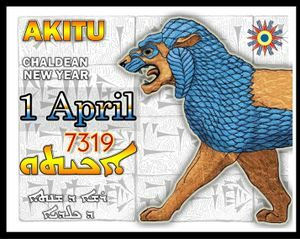 Following the first new moon after the vernal equinox in late March, the Chaldean Babylonians of Mesopotamia would honor the rebirth of the natural world with a multi-day festival called Akitu. This early New Year’s celebration dates back to around 5700 B.C., and is believed to have been deeply intertwined with religion and mythology. During the Akitu, statues of the gods were paraded through the city streets, and rites were enacted to symbolize their victory over the forces of chaos. Through these rituals the Babylonians believed the world was symbolically cleansed and recreated by the gods in preparation for the new year and the return of spring. The festival - better: conglomerate of festivities - was celebrated on two locations in Babylon: in the temple of the supreme god Marduk, the Esagila, and the 'house of the New year' which was situated north of the city. The two gods who were in the center of the festival were Nabû and his father, the supreme god Marduk, who was in the first millennium BCE usually called 'Bêl', Lord, because his real name was considered too holy to be pronounced. The Babylonian festival traditionally starts on 21 Adar - 1 Nisannu. March 21st to April 1st for 12 days. The festival - better: conglomerate of festivities - was celebrated on two locations in Babylon: in the temple of the supreme god Marduk, the Esagila, and the 'house of the New year' which was situated north of the city. The two gods who were in the center of the festival were Nabû and his father, the supreme god Marduk, who was in the first millennium BCE usually called 'Bêl', Lord, because his real name was considered too holy to be pronounced. The victory procession to the "House of Akitu" where Marduk's victory in the beginning of Creation over the dragon Tiamat (goddess of the nether waters) is celebrated. The House of Akitu which the Chaldeans called "Bet Ekribi" (“House of Prayers” in Chaldean language), was about 200 meters outside the city's walls, where there were wonderful trees decorated and watered carefully out of respect to the god who's considered the one to grant nature its life. The victory procession was the population's way to express its joy at Marduk's renewal of power and the destruction of evil forces which almost controlled life in the beginning. The gods return accompanied by their Lord Marduk to meet again in the Destinies Hall "Upshu Ukkina", where they met for the first time on the eighth day, this time they will decide the fate of the people of Marduk. In Chaldean Babylonian philosophy Creation in general was considered as a covenant between heaven and earth as long as a human serves the gods till his death, therefore, gods' happiness isn't complete except if humans are happy as well, thus a human's destiny will be to be given happiness on the condition that he serves the gods. So Marduk and the gods renew their covenant with Babylon, by promising the city another cycle of seasons. After the fate of mankind is decided, Marduk returns to the heavens. The last day of Akitu. 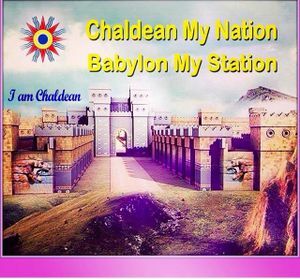 The gods return to Marduk's temple (the statues are returned to the temple) and daily life resumes in Babylon and the rest of the Chaldean cities. The people begin to plow and prepare for another cycle of seasons. The Babylonian Akitu seems to have been a development from the earlier Sumerian myth of Inanna's descent into the underworld, from the early Bronze Age. Marduk in the myth enacted in the festival is preserved in the so-called Marduk Ordeal Text (KAR 143). In this myth, Marduk appears as a life-death-rebirth deity, reflecting the festival's agrarian origin based on the cycle of sowing and harvesting. He is imprisoned in the underworld and rises again on the third day. The obvious parallel to the death and resurrection of Christ celebrated at Christian Easter has been noted at an early time, and elaborated in detail by Heinrich Zimmern in his 1918 editio princeps. Tikva Frymer-Kensky noted that Pallis (1926) rejected some of the Christological parallels noted by Zimmern, but continued to stress that the death of Marduk, the lamentation over him, his subsequent restoration and the rejoicing over his resurrection is among the Near Eastern templates for the Christ myth. Yet Frymer-Kensky goes on to say that further analysis by von Soden shows that this text is not a tale of a dying and resurrecting god, but that it is a manifestly political text relating to Babylon. :139 The political themes don't involve anyway that the mythical module of the resurrecting god would be meant as inexistent. This theme of a dying young (harvest/vegetable) God (common throughout the Middle east) is also reflected in the legends of Tammuz, and is condemned in the Bible as "women weeping for Tammuz" even in the temple of the Hebrew God. Chaldeans are celebrating the Akitu festival around the world. Chaldeans from America (Michigan and California) along with Chaldeans from Australia and Iraq are united to mark this Chaldean heritage celebration annually. 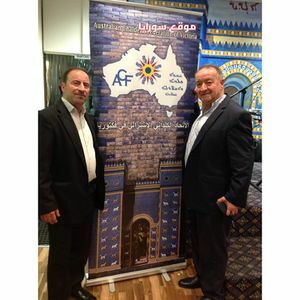 1-  The Babylonian Akitu Festival: Rectifying the King or Renewing the Cosmos? (n.d.): n. pag. Web. 2-  The Babylonian Akitu Festival by Svend Aage Pallis Review by: S. S.The Journal of the Royal Asiatic Society of Great Britain and Ireland , No. 4 (Oct., 1927) , pp. 895-897. 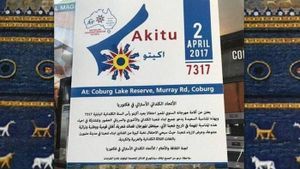 3-  "The Akitu-Festival - Www.GatewaysToBabylon.com." The Akitu-Festival - Www.GatewaysToBabylon.com. N.p., n.d. Web. 4-  Gard, Carolyn. 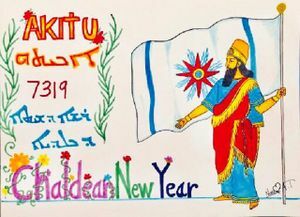 "Akitu The Babylonian New Year's Festival." Calliope 11.3 (2000): 36. MAS Ultra - School Edition. A. Sachs (1969). "Akkadian rituals", in: J. B. Pritchard, ANET, 3rd. ed., Princeton, pp. 331–4. Karel van der Toorn (1990). 'Het Babylonische Nieuwjaarsfeest' in Phoenix. Bulletin van het Vooraziatisch-Egyptisch genootschap Ex Oriente Lux 36/1, 10-29. 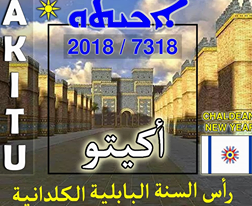 ↑ The Chaldean Babylonian Akitu Festival: Rectifying the King or Renewing the Cosmos? (n.d.): n. pag. Web. ↑ "The Akitu-Festival - Www.GatewaysToBabylon.com." The Akitu-Festival - Www.GatewaysToBabylon.com. N.p., n.d. Web. ↑ Gard, Carolyn. 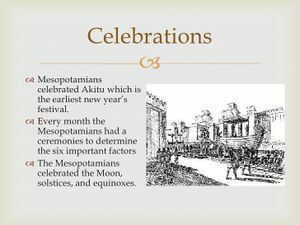 "Akitu The Babylonian New Year's Festival." Calliope 11.3 (2000): 36. MAS Ultra - School Edition. ↑ 4.0 4.1 "Middle Eastern religion". Encyclopædia Britannica. Encyclopædia Britannica Online. Encyclopædia Britannica Inc., 2014. Web. This page was last modified on 31 March 2019, at 06:26.